Webster Lake Association’s New President, Val Perkins! The Webster Lake Association is happy to introduce our new President, as of August 4, 2018, Val Perkins. Val Perkins has accepted the Webster Lake Association’s President’s “gavel”, and we are grateful to have her leadership. She follows Mark Lorenze, who held that position since 2009. At the August 4th Annual Meeting, Mark was recognized for his years of service and the many accomplishments he oversaw during his nine years as president. In gratitude, he was presented with a beautiful granite bench and a glass gavel, both thoughtfully inscribed to show the appreciation of the membership. Mark assures the Association he will continue to volunteer his time to benefit the lake. He and his wife Nancy divide their year between Webster Lake and Bradenton, Florida, heading down to the Sunshine State in the fall and returning in the spring. 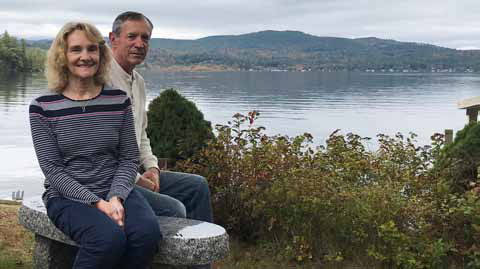 For over 50 years, the Perkins family has enjoyed summers on Webster Lake and all it has to offer. Val was introduced to the lake in 1970, when her family rented the camp on Webster Avenue from Jeff’s parents, who had bought the camp in 1968. The families had mutual friends who all enjoyed those early summers together. She and Jeff started dating in 1971 and were married in 1975, and the Lake holds a store of wonderful memories for them. They watched their two sons, Matthew and Michael, learn to swim here and participate in all the water games and fun, bringing their friends over the years, and eventually their wives. In the past 11 years, a new generation of the Perkins family has come to love Webster Lake. Jeff and Val have five grandchildren who love swimming, jumping on the mats, tubing from the wave runner, jumping off the pontoon boat at “Pirate’s Cove”, and s’mores around the campfire. Before retiring and moving to the Lake as year-round residents, Val was a dental hygienist and Jeff was a food service director. They also owned a catering business for 19 years. Now involved in the Franklin Community, they have come to enjoy the lake in the winter season as well.